The best place to start your tour, get your fix of the most scrumptious breads and baked goods you will ever taste. A Bread Affair is known for using only the freshest ingredients that are in season from local farmers and best of all, everything is made by hand. It’s no surprise that most tourists start and end their tour of Granville Island with A Bread Affair. Oh and did we mention they serve the most amazing sandwiches, ever? This is where vendors, farmers, and butchers from all over come to sell their wares. Everything is harvested fresh daily and there is tons to see. Keep an eye out for handmade and unique crafts for sale, as well as the occasional busker! If you want to sit down and eat—or just enjoy the scenery—try the courtyard by the water. The beautiful view is picture perfect. Located directly across from the public market, this hole-in-the wall structure, which is instantly recognizable with it’s blue exterior, offers a plethora of options for curious (and hungry) visitors. If you are looking for kitchen ware, a quiet bite to eat, or want to check out a very unique paper based business named Paper-Ya (Japanese for Paper Shop) then look no further. The Net Loft is one of Granville Island’s best-kept secrets, and is certainly a place that you won’t forget any time soon! Whether you are into avant garde or a modern take on the classics, you can enjoy many live performances on the Island. If you’re shot on time or money, stop and watch one of the many buckers playing along the Island’s cobblestone streets. Plays or indie art, you’ll find it all here. If you start to feel hungry there are plenty of options. From casual to high-end, there’s something for every budget. Granville Island is known for its great food—and soon you’ll discover why. Keep an eye out for these visitor favourites: Backstage Lounge, Cats Social House, Dockside Restaurant, and Edible Canada at the Market. You’ll find tons of places to grab a drink, dinner, coffee, or just a snack. The Granville Island Brewing Co. started on the Island (the name gives it away!) and was the first cottage brewery in all of B.C. Sit and enjoy a beer or take a tour of the brewery. Can’t get enough? 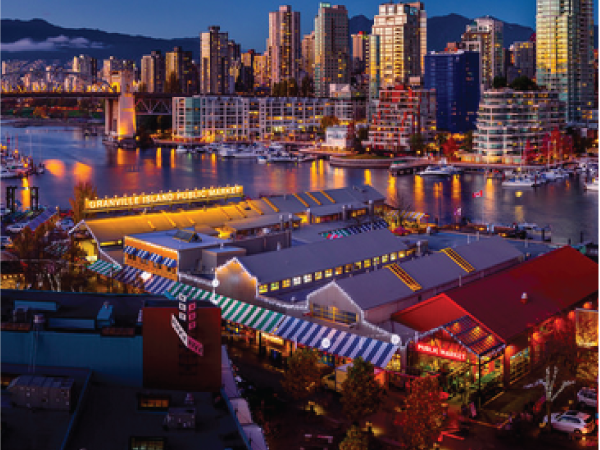 Try the ales at the Dockside Restaurant at the Granville Island Hotel or visit the only Artisan Sake Maker across Canada in Railspur Alley. Granville Island is the home of the Emily Carr University of Art and Design, so you can see why it attracts such a wide variety of talent. There are plenty of art exhibits, many for up-and-coming student artists, as well as studios for glassblowing, jewellery, and others arts and crafts. The Kids Market is stocked full of items and activities to please your little ones. Come see magic shows, juggling, the Water Park—and don’t forget to stop by and say “Hi” to the live turtles. The indoor Adventure Zone provides endless entertainment and even adults will enjoy looking at all the neat items and toys. Don’t forget to pick out a nice souvenir! Explore the English Bay on a rental boat, ride the False Creek Ferry, or take a tour on the Aquabus. You can sit back and enjoy the oceanic scenery—or plan a whale watching or kayaking trip for you and a friend or date. There are tons of festivals and events all year, so you don’t have to worry about missing out on the fun. Choose from a variety of events: music, literature, performing arts, or food—to name a few. Festivals take place all around the Island, from the outdoor amphitheater to many studios, cafes, and even Emily Carr University. An absolute staple of any travellers journey to Vancouver, this famed landmark provides one of the most scenic and beautiful walks that the city has to offer. Extending far beyond Granville Island, the Seawall covers a large part of the city including Stanley Park, which has topped many lists of must-see locations worldwide.